Short on time, but long on ambition? Looking to turbo-charge your workout? You came to the right place! Check out this 20 minute circuit training workouts from Stew Smith at military.com, perfect for the gym. This circuit workout incorporates upper body, lower body, and cardio exercise all into one workout. By staggering the upper body, lower body and cardio exercises in the circuit, it allow you to work the entire body without having any rest between exercises. This keeps your heart rate up for the entire 20 minutes. One thing you do need to time this workout is an exercise timer. 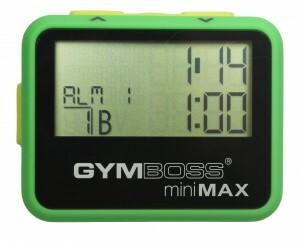 Lucky for you, your Gymboss miniMAX timer makes the perfect circuit training timer for this circuit workout. Here is the workout by Stew Smith at military.com. To time this entire workout, set your Gymboss miniMAX in 3+ INT mode by entering all fourteen of the interval times listed in the workout above. Each time it beeps/vibrates, it's time to do the next exercise. If you wish to perform the entire circuit twice, simply set the rounds for 2 repeats instead of 1.